While I was in Dallas last week for work, I visited the Nasher Sculpture Center. PJ and I had visited it a few years ago, and I’m not really all that much into sculpture, but I had time between meetings and was in the neighborhood, so I decided to stop in and see what’s on exhibit. 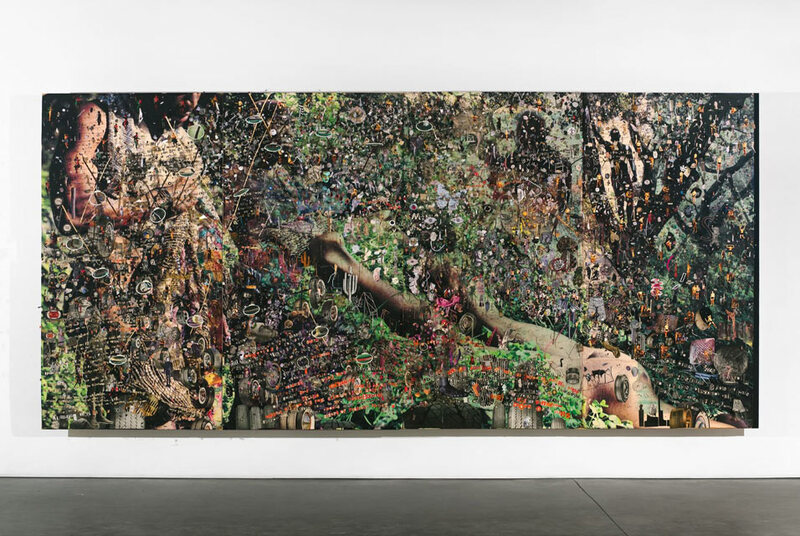 Over the past decade, Hundley has developed a multifaceted, intricate art using paint, photographs, and organic and found materials ranging from bamboo, goat hooves, and pine cones to pins, magnifying lenses, and gold leaf. The mythic world of ancient Greek tragedy becomes vividly contemporary as Hundley reimagines Euripides’s last play, The Bacchae, in twelve works presented in one of the Nasher’s street-level galleries. The king of Thebes, Cadmus, abdicated in favor of his grandson, Pentheus, due to his old age. Pentheus soon banned the worship of the god Dionysus, who was the son of his aunt Semele, and did not allow the women of Cadmeia to join in his rites. An angered Dionysus caused Pentheus’ mother Agave and his aunts, Ino and Autonoë, along with all the other women of Thebes, to rush to Mount Cithaeron in a Bacchic frenzy. Because of this, Pentheus imprisoned Dionysus, but his chains fell off and the jail doors opened for him. Dionysus then lured Pentheus out to spy on the Bacchic rites. The daughters of Cadmus saw him in a tree and thought him to be a wild animal. Pentheus was pulled down and torn limb from limb by them (as part of a ritual known as the sparagmos), causing them to be exiled from Thebes. Some say that his own mother tore off his head, and that she was the first to attack him, tearing his arm off. It’s an amazing work of art, one that I could have stared at for hours. I’ve ordered the book that accompanies the exhibit — maybe I’ll have more to say about it once I read the book!